Cyclocross is finally here and we are starting off the season by checking off the top item on our ultimate wishlist: A full on SVENNESS with SVEN. If that’s why you are here and these words are just getting in the way, I don’t blame you. Hang in there for a handful of sentences and you are at the video. 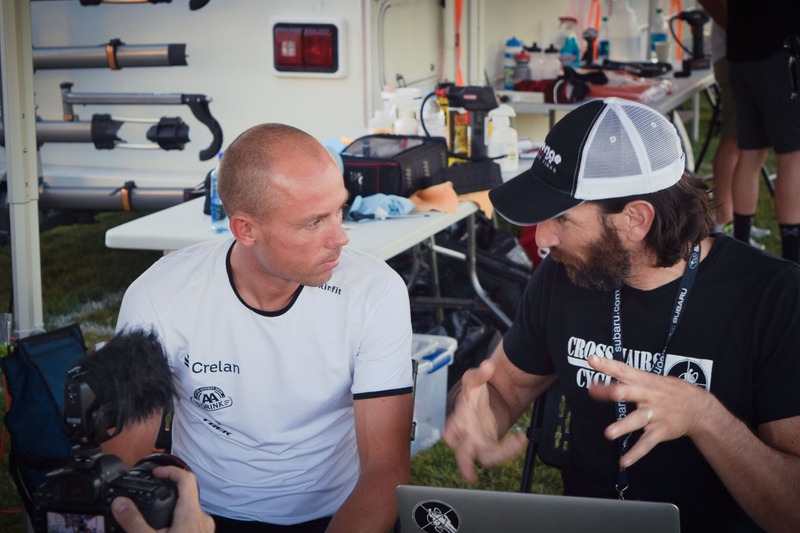 But before you get there, allow me to give you the quick and dirty intro: While at Cross Vegas last Wednesday, we had an opportunity to sit down with Sven Nys and watch clips of races together. He was gracious enough to take the time, hours before winning the Cross Vegas men’s pro race, to explain his technique, strategy and mindset for dealing with different cyclocross situations. As you will see, the insight he gives is something special. I want to thank Trek Bikes and Matt Shriver for helping make this happen, Bruce Buckley for filming and stage managing, and Dan Tille of Fulcrum Coaching for being my wing man. Also a big thanks to Brook Watts and Cross Vegas. Okay, here’s the video. If you are interested in how this interview came to be, there are many words on that below the video. Thanks for watching. I’m going to be perfectly honest with you. As I was flying to Las Vegas for Interbike and CrossVegas I was not confident that I’d get the chance to talk to Sven Nys. It’s Vegas so let’s put this into odds. I was giving myself about 50 to 1 odds that an interview would take place. Even less than that for the type of interview I wanted to do. But I pulled out my laptop and spent most of the flight preparing, just in case I did, in fact, beat the odds. Vegas. In April of this year I flew to Belgium to ride the cobbles, take in Flanders and Paris Roubaix and hang out with my buddies and Skills Drills and Bellyaches co-collaborators, Dan Tille and Rusty Williford. Before heading to Belgium, a friend of mine who works with the Trek Factory Racing Pro Mountainbike team made some introductions and we were able to tour the TFR Service Course. He also reached out to see if Sven was in town and available for an interview. It turned out that Nys left the day we arrived, to train in Mallorca for the upcoming MTB season. In retrospect, I’m glad that interview didn’t happen because I hadn’t yet stumbled onto the SVENNESS with SVEN idea. An April interview, while an awesome experience, would’ve probably been me asking run-of-the-mill questions and getting run-of-the-mill answers. Thank goodness for missed connections. Fast forward several months and Dan Tille and I are planning our trip to Vegas for Interbike and Cross Vegas and he is constantly badgering me about meeting Sven. “Missed him in Belgium, now’s our chance to get him in the States.” “I know this is self-serving, Bill, but I really want to meet the guy …” “Fine, Dan … I’ll try again …” Don’t tell Tille, but before the badgering began I had already reached out to Matt Shriver, who has worked closely with Sven since he started riding Trek bikes and was instrumental in forming the Trek/Sven relationship. Matt told me “I’ll see what I can do.” That was all I really heard from him. Nothing more firm then an “I’ll try.” That’s what I was basing my odds on. C’mon Vegas.